The social media reaction to Wigan Athletic’s two-all draw against Bristol City. Substitute Anthony Pilkington scored at the death to help Wigan Athletic earn a vital point at Ashton Gate. Reece James’ spectacular long-range effort had given Latics a deserved 37th minute lead before Bristol City scored twice in three-minutes to turn the game on its head. 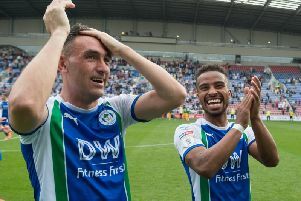 It was looking increasingly likely that Latics’ misery on the road would continue but substitute Pilkington stabbed home a 93rd-minute equaliser to rescue a point. With Rotherham United, Millwall and Birmingham all winning, it could prove to be an priceless result at the end of the campaign. Latics moved to 19th place following the 2-2 draw, and still sit two points above the drop zone with six games remaining. Wigan fans acknowledged the importance of Anthony Pilkington’s last-gasp equaliser on social media.